Last Christmas one of my favorite gifts to receive was a set of handmade fridge-magnets. 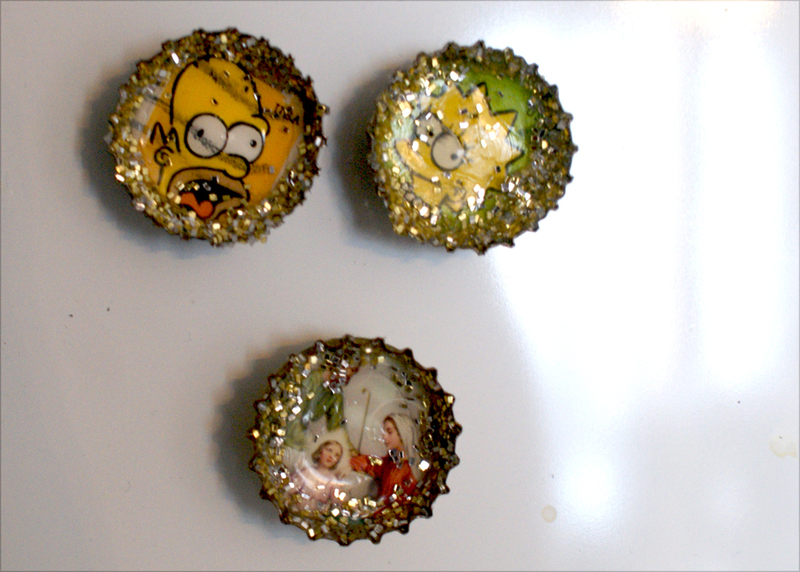 My pal made these with old bottlecaps (never throw them away again! ), glue, magnets, images, and glitter. Remarkably simple, and completely fantastic. This link provides clear instructions on how to make them, but basically, you just need to apply those objects together in a way that makes sense. One good note is that “you want to glue the non-magnetic side so to the bottle cap and leave the magnetic side exposed so it adheres to metal.” Yup!!! My friend gave me a Catholic picture to remind me of her, and two Simpsons images chosen especially for me.